This humble organization, after school program and social change initiative has been an officially recognized 501(c)(3) non profit for 3 years now. Founded 5 years ago, all of us who have served the Animate A Way mission have learned a lot along the way. As I step back in to lead, I am reflecting on all of those lessons: How best to serve underprivileged communities, how best to teach students about the necessities of social change and how to make awesome animations. Along with the help of a very supportive board of directors, we are setting about to create new curriculums, increase transparency and promote the future leaders of our communities and their voices. We are currently in a state of rebuilding. The mission, intent and content of the org is staying in tact, but with leadership changes, we are taking advantage of the time to strengthen the bones of the organization’s functioning. In this week of Thanksgiving and with the cheer of the holidays around the corner, we wish everyone the absolute best. We are thankful for healthy communities and strong youth voices. Let’s do great things in 2018! The summer is almost here and this year Animate A Way is hosting 2 awesome camps at the Museum of Photographic Arts! The July 11-15 camp for grades 4-6 is sold out, but there is still space from July 18-22 for 1st – 3rd graders. Head over to MoPA’s website to register. Theses camps are a ton of fun as students play games, learn about filmmaking and animation, go on photo safaris and create their own animations every single day. Beyond all the fun and entertainment, the students will learn a lot about teamwork and working together through the very hands-on medium of stop motion. The courses are instructed by Animate A Way Executive Director and animator Steven Topham. Sign up now before the final spots are filled! LUNAFEST is coming on March 10! Animate A way is very proud to host the LUNAFEST women’s short film festival for the third consecutive year. The program will take place on March 10 from 6pm – 9pm at the USD Hahn University Center, Forum C, located at 5998 Alcala Park, San Diego, CA 92111. We are partnering once again with the USD women’s center to bring this incredibly well curated selection of short films made by women filmmakers to you. Tickets are $10 general admission and $5 for USD students. Find more information at this link, including the trailer for this great exhibition that includes some awesome animated works. Don’t let the “for women” tagline dissuade you from coming. This is an exceptional program that absolutely appeals to everyone. Volunteers to help us run this event smoothly are always appreciated. Please contact Karla Duarte with your intent or with any questions you may have. Summer time means Summer Camp! This year’s camp is 4 hours a day for 5 days from July 13-17, 10am – 2pm at the Museum of Photographic Arts. MoPA is located at 1649 El Prado, San Diego, CA 92103 in Balboa park along the Prado, just across from the koi pond and botanical garden. The objective of this camp is to teach the students the fundamentals of film-making and photography. In the classroom, they will learn everything they need to know to create an animated film from concept to completion. Using professional equipment and their creativities, they will all leave the camp with at least one short stop-motion animated film of their creation. Campers bring a lunch, which we will eat out in the park. For 30 minutes after lunch, we will go on photo safaris and learn how to take great photographs of all the beautiful things in the park. We emphasize teamwork, creativity and fun and it will be a great week! The camp is tailored for ages 7-14. Boxtrolls Tomorrow and So Much More! Tomorrow night, Saturday February 21, head to the Bayside Community Center for a fun family screening of the hit stop-motion film The Boxtrolls! Create your own animated film in our animation area or dive into some Boxtrolls arts and crafts projects. There will also be a snackbar and all kinds of fun things to do. The doors open at 6:30 pm with the screening of the Boxtrolls beginning at 7:00. Come early to meet everyone, make an animation and to watch a bunch of short animated projects together. The Animate A Way team is incredibly busy right now as our Middle School Girls! Camera! Action! group begins production on their anti-domestic violence public service announcement and our Bayside students are making a short animation almost every week. With March almost here, we will begin a High School anti-violence PSA group at Kearny High School as well as a recycling awareness animation project for elementary aged kids at Francis Parker. With so much going on, we need your help! We encourage you to get involved with us by volunteering at our events or through regular donations to our cause of empowering youth leaders throughout San Diego. 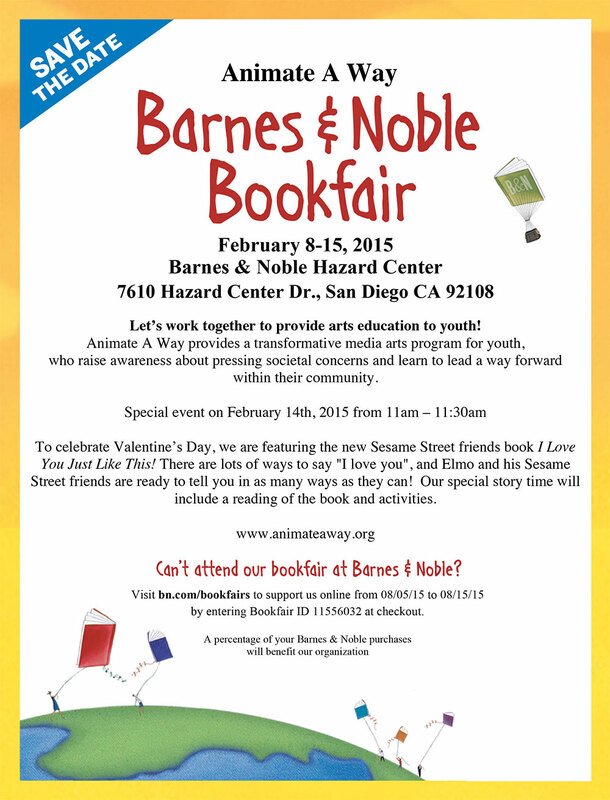 February 8 through 15, shop at Barnes and Noble and support Animate A Way! or shop in store at the Hazard Center location (7610 Hazard Center Dr ., San Diego CA 92108) and let them know that you are shopping to support Animate A Way when you’re at the register. or get all the details from the image below. With our new year of programming, comes a renewed focus on Community. Community is everything. We come together in cities to live and work. We gather in public places to share in the beauty of what we can create. We sit in theaters together, laughing and sharing emotions. We tap our students into the community and endeavor to steer our communities towards greatness and safety. This year, we are partnering with the Bayside Community Center in Linda Vista to put on quarterly screenings. More importantly, we are holding community animation and filmmaking classes every Thursday from 3pm – 5pm. It all kicks off this Thursday with an open house. Since it is October 30th, we will of course have some trick-or-treat candy for all of our visitors. These classes are open to all students from 4th grade all the way through college. We want to encourage those who do not have the resources to make the films they envision, to use our resources. Animate A Way will provide all of the tools as well as knowledgeable professionals, so that anyone who joins the class can see their project through. No one will be turned away. We believe so strongly in the Linda Vista and San Diego community, that if a student comes to our doors desiring to unleash their creativity and vision, we will work with them. We will either find sponsors for each individual student, or students will make films commissioned by Animate A Way. Any student who can pay the classroom fees will be free to make their own film with our guidance. The classes will have a teaching structure, but will largely be focused around hands on steps towards the production of a film; just like we do in our after school classrooms. We are so excited and proud to be in a position to give even further to the community and we can’t wait to hear all of the wonderful ideas that all of San Diego’s future filmmakers will come up with! Let’s bring your ideas to life. A New Year of Programming! 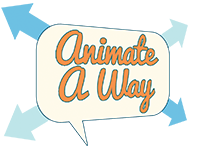 The 2014-15 school year is here and Animate A Way is ready to create a new team of filmmaking and animating advocates. This year, we will be leading 3 classrooms in the Linda Vista area of San Diego. We are returning to our founding school, Montgomery Middle and expanding to hold classes at Kearny High School. We are excited to roll out a new community program through a partnership with the Bayside Community Center in Linda Vista. At Bayside, we will be holding weekly open classes that anyone from grades 4 all the way through college can attend. Karla Duarte and Steven Topham from Animate A Way will guide students who attend these classes through making their own films and animations from conception to completion. With our partner, Pagasa Pasta, we will be helming an animation competition and inviting everyone interested in competing to join us at Bayside! Students will be able to use our professional and technical resources to see their ideas become life. We believe in serving the underprivileged and creating leaders and will not turn away anyone who wants to further themselves. We look forward to meeting our new students in all of our locations and sharing in their talents and leadership with the entire San Diego community throughout the year. There is so much that goes on with Animate A Way, but the thing we really look forward to is the moment in the sun at the end of the year for all of our participants. We have a fantastic partnership with the Museum of Photographic Arts (MOPA) in Balboa Park, who helps us put on the gala exhibition of all of the great work that our youths have made throughout the year. June 4th will be the date. It all begins at 6pm with a mixer and gathering. Our fantastic sponsors will provide refreshments and snacks while guests will have the opportunity to browse an incredible craft fair. But the good part starts at 7 pm. MOPA’s 250 seat theater is incredible. Inset within the high roof are hundreds of twinkling lights. The gradual slope of the seating area leads to a raised stage where all of our youth will stand, beaming with pride, smiles and more than a little nervousness as a full crowd stands and applauds their courage. They have spent the better part of the year learning about domestic violence and how their voice can make in impact against it. Their hands have been busy and diligent creating a public service announcement to lend even more distance to their voice. And their creativities have been in overdrive as they constructed every word of the script and every image in the final product. It is their work and it is their cause. We can’t wait for June 4! Animate A Way has been very busy in the last two months with a fantastic new partnership with Pappalecco Italian-American Cafes who helped us host two different fundraising opportunities. If you are in San Diego and like incredible coffee and gelato, be sure and seek them out. There is a lot more that has happened and will happen. We’ll keep you in the loop with more regular updates throughout the coming days and weeks. We are getting ready to start the year with our first fundraising event on Sunday, January 12, 2014 at the Italian Cafe Shop Pappalecco in Hillcrest. Francesco Bucci, CEO of Pappalecco and winemaker Piergiorgio Castellani have partnered up to host an event for Animate A Way so that we can continue creating awareness in the community about Teen Dating Violence and furthering our education program in the community. Join us for an evening that will let you travel to one of the best Italian Wineries in the world. Meet Piergiorgio Castellani, Marketing and Development Manager of the winery. To RSVP you can get your tickets at Eventbrite.